This is Mihály Schwechtje's short film collection. You can find festival winner Cold Grove and the public's favourite one Powdered Sugar. If you want to know how a fruit can change the life of the apple breeder, choose the Apple , if You want to discover the neonoir world, choose the Vortex. If You prefer the simple form, look throught the two windows of the Buffet. Zsolt (25) works in a pet shop. On an evening arrives home to his stuff is packed by his girlfriend (Adrienn, 23) and breaks with him. Since there is no other place to go, the guy moves in the pet shop. In that evening as he is checking his advertisement on a dating website, starts to stray among others' pictures and finds a girl who attracts him. János is a good man. He is an apple breeder. People adore the fabulous farm he is living in. One day Kopasz, the legume reseller comes over and discovers an apple grown on the locust tree. Both of them are very surprised and trying to find out what happened. At the end, Kopasz proposes to take off the apple and forget it, and he goes away. János stays alone, but he is unable to work, he keeps thinking about the apple. 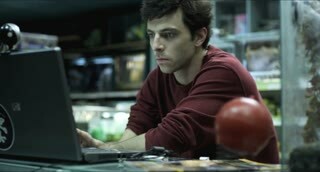 Than he takes all his courage cuts off the apple and goes to the laboratory to find out what has happened. János egy rendes ember. Almatermesztő. A tanyája olyan szép, hogy a csodájára járnak. Egy napon azonban érkezik hozzá Kopasz a zöldségkereskedő, és felfedezi, hogy egy alma nőtt az akácfájára. A két ember, akárhogy is tűnődik, nem találja a megoldást, hogy ez hogyan is történhetett. Kopasz végül azt tanácsolja Jánosnak, hogy szedje le azt az almát, és felejtse el az egészet, ő inkább el is viharzik. János egyedül marad a portáján, de sehogy sem tudja tenni a dolgát, mert folyton csak arra az almára gondol. Ezért aztán veszi a bátorságot, levágja az almát és útnak indul a laboratórium felé, hogy kiderítse, mi is történhetett. The film tells the story of three persons. Two young boys are struggling every day to earn enough. For living they collect garbage from the country road what they try to resell. But there is someone, the Pilot Hat man who does the same and can live from it better. In this misery, the only way to survive is avoiding mistakes and staying disciplined. Togetherness keeps the boys alive. The younger guy, Robi is a dreamer, he has an instable personality. His unreliability drifts them in a fatal situation.